Cherished by the local community, Seboeis Lake offers clear waters, scenic vistas of Mt. 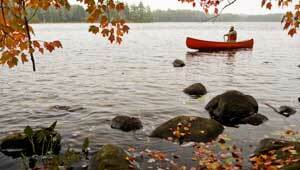 Katahdin, and opportunities for snowmobiling, ATV riding, camping, hunting, fishing, canoeing, and wildlife viewing. It has a large population of nesting loons and some of the finest moose-watching in the entire region. The new acquisition includes 12 miles of frontage on Seboeis Lake and Northwest Pond and another 4.8 miles of island shoreline. It also guarantees public access to approximately five miles of Interconnected Trail System (ITS) Connector Trail 111, which links two major north-south snowmobile routes. The acreage will be added to the existing Seboeis Unit, meaning that 95 percent of the Seboeis Lake shoreline now is permanently protected for public access. This project is part of a larger Katahdin Forest Expansion effort, which aims to protect key resources and ensure public recreational access.